The aims and objectives of the IHRSA are to promote Hunting Rifle Shooting to hunters and shooters in all countries of the world. The IHRSA is aiming to engage as many countries as possible as members of the Association and subsequently promoting Hunting Rifle Shooting as a worldwide sport amongst hunters. The Association will coordinate the shooting format according to the different approaches to hunting followed in member countries. The members of the IHRSA will be countries and not individual shooters. Each member country will have its own members, which will belong to that country’s national body. Member countries will control and manage their own members in their respective countries. Hunting Rifle Shooting is a sport where hunting rifles are used to shoot at paper targets of animals commonly found and hunted in the member countries.Suspended steel targets varying in size and shapes are also used. This is a sport for the hunter, it is the closest you will find to real hunting, and designed exclusively as a test for hunters with hunting rifles under hunting conditions. 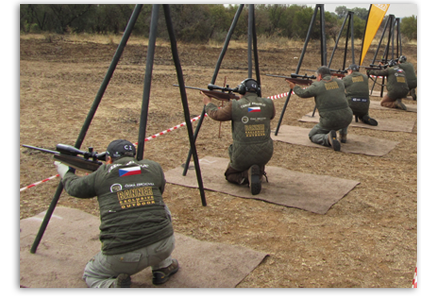 Competitions are set up in the veld, but can also be conducted on a shooting range. The purpose of Hunting Rifle Shooting is to test and promote a hunter’s abilities: his ability to judge distance, knowledge of his bullet’s external ballistics, judging wind strength and the influence of the wind on the bullet’s path, ability to shoot from various positions and also shooting in a limited time format. The competitions are structured so that all the above elements are tested during an event. It is a shooting contest of variable and non-standard format that examines practical marksmanship as it occurs in the hunting field. The competitor is ultimately tested on correct shot placement, achieved by using all of these abilities. Ranges are designed to accurately simulate field hunting conditions to test the ability of the hunter and not only the accuracy of the rifle. Rifles must be accurate at reasonable distances for the shooter to perform well, but competitions will be arranged to ensure that specialist rifles such as single shot Bench Rest, F-Class or Silhouette rifles do not have a distinct advantage over a good hunting rifle. The IHRSA is continuously looking at innovative methods to develop and improve the sport and attract more hunters and shooters. The IHRSA is continuously adding new targets to the existing range to keep the sport interesting and challenging.